Most have 10-50km wide irregularly-shaped holes at their centres. Scientists soon interpreted the holes as volcanic vents and the spots as material thrown out by volcanic explosions. 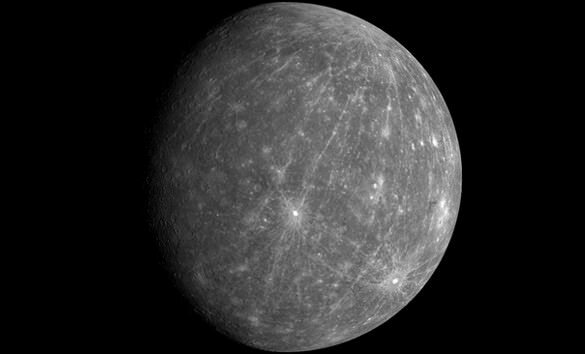 Explosive volcanism was not expected at Mercury, because formation of a planet close to the heat of the sun should have deprived it of the gaseous content necessary to power explosions. And how long before some alarmist claims that red spots are a sure sign of Climate Change? Venus rotates slowly in the wrong direction and has a MUCH too dense atmosphere to have originated in it’s present position. An amateur astronomer and writer, Immanual Velikovsky pointed these things out in 1948, a generation before the space programs discovered them to be true. Based on his studies of Ancient writings and astrophysics he speculated that Venus was a satellite of Saturn dislodged by some event and entered the inter system by way of a pass near Jupiter. There is no indication of a collision as Venus has no satellites or debris orbiting it. I remember when Venus was considered to be a twin of Earth. Venus is nothing like Earth! As to Mercury and it’s spots ? ? ? Well it does rotate in the correct direction, slowly, so not quite tidally locked to the Sun. Small enough to be nearly core dead but tidal stirrings could cause shallow heating. Immanual Velikovsky claimed that Mercury and Mars were of the original creation while Earth/Luna and Venus were creations of later events. He also correctly described Titan.